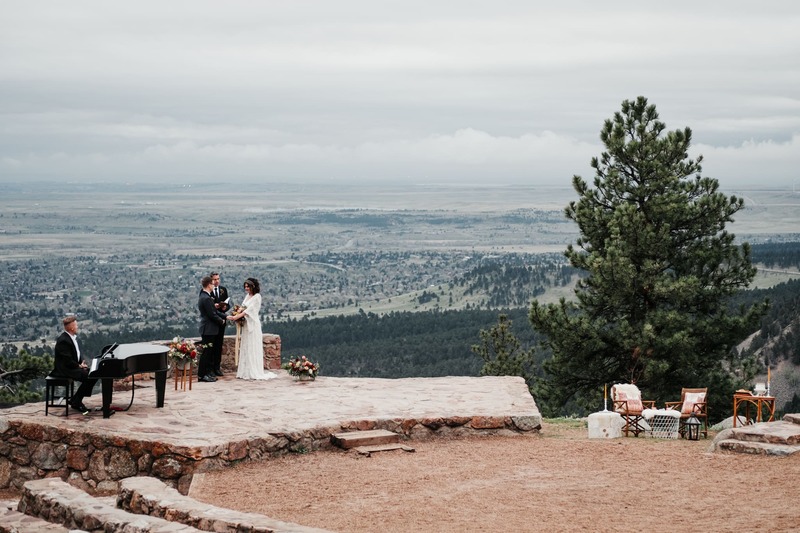 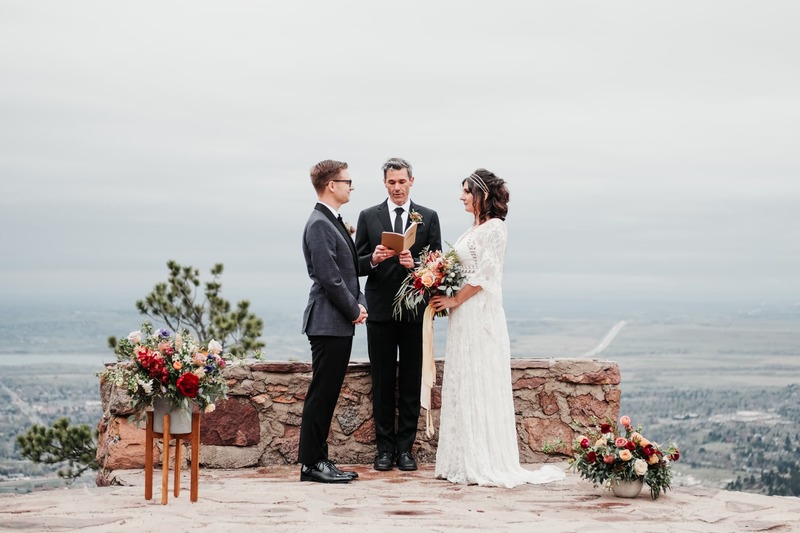 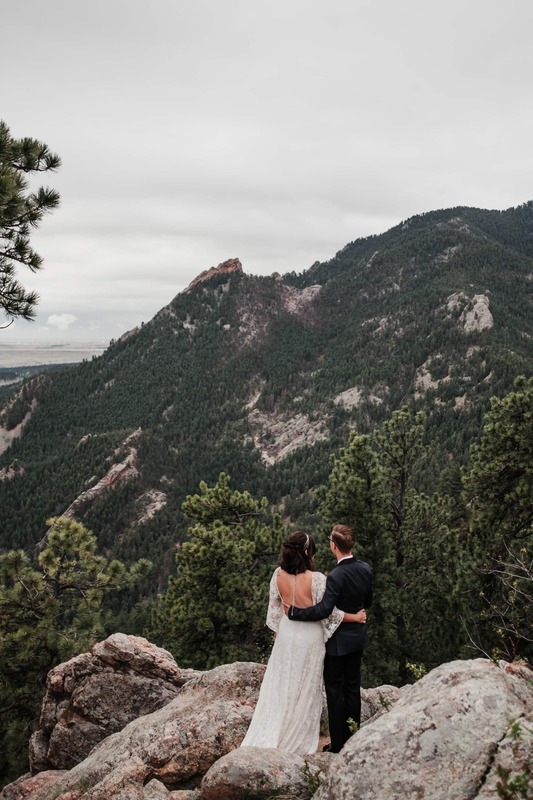 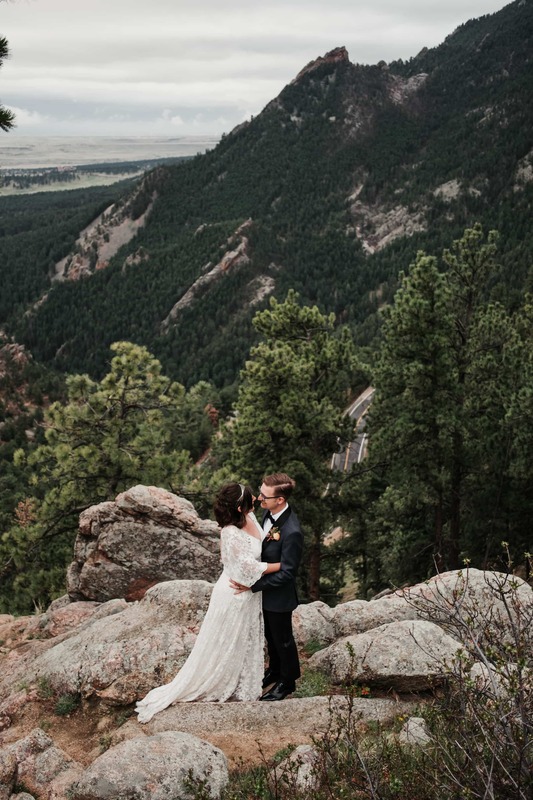 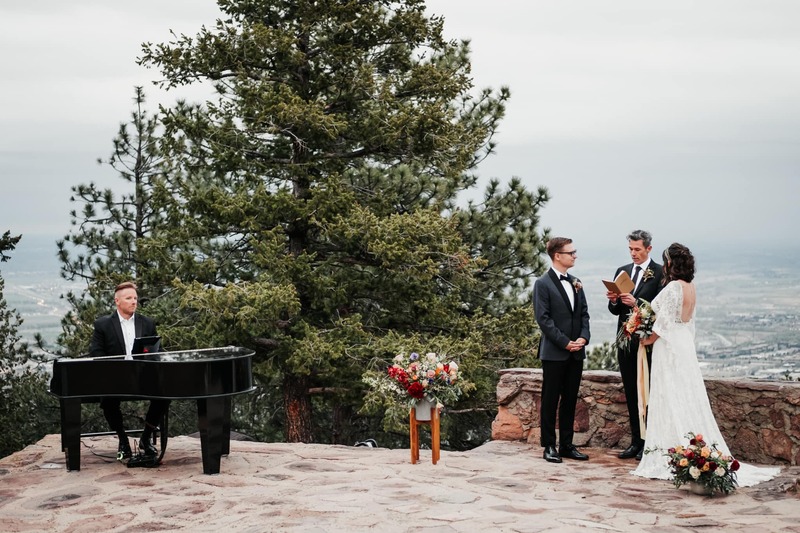 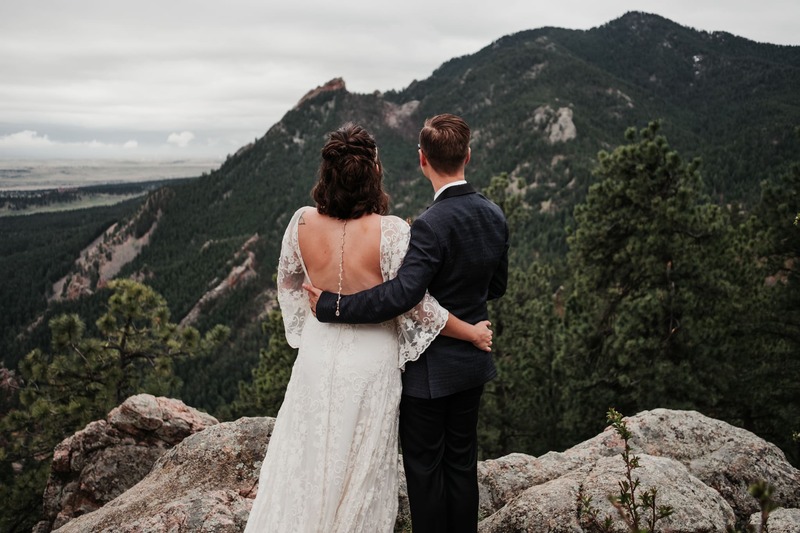 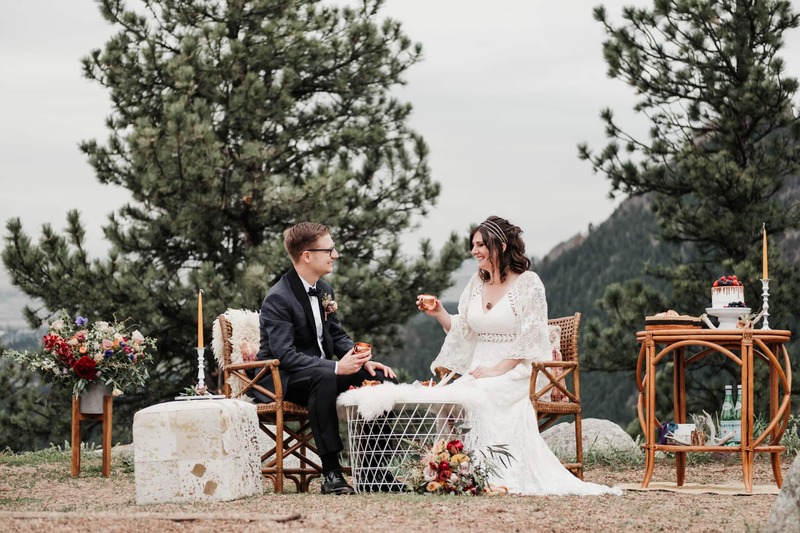 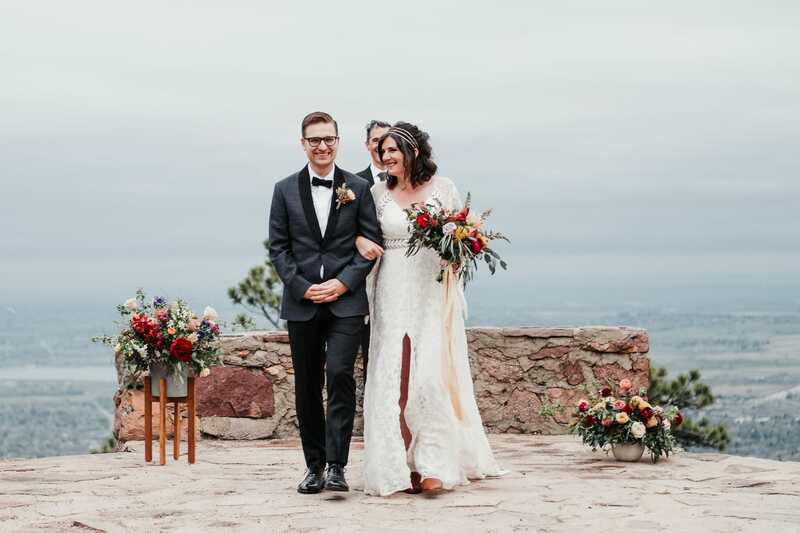 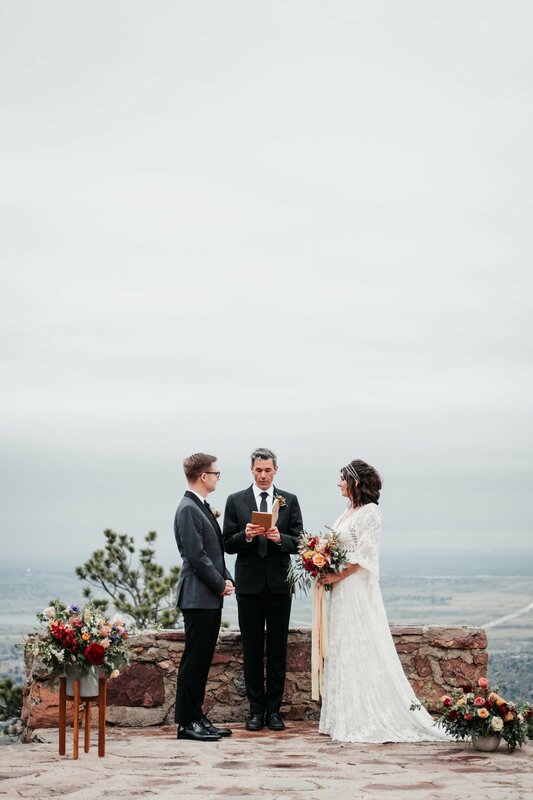 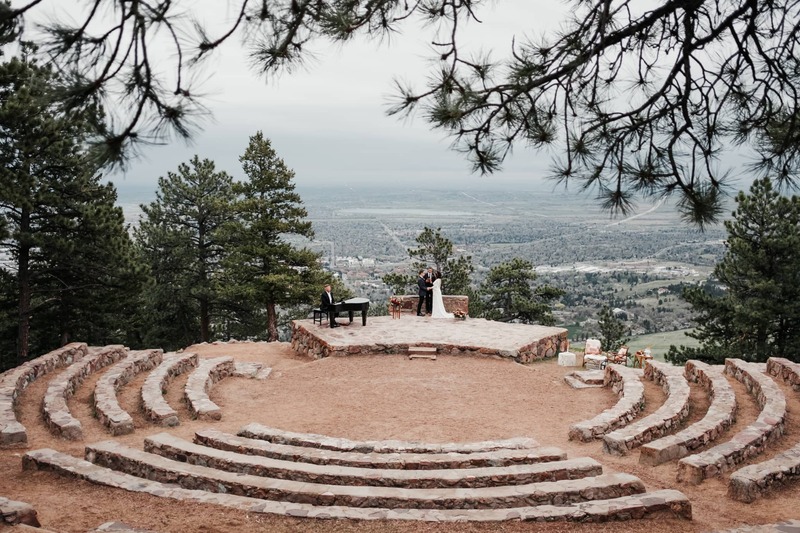 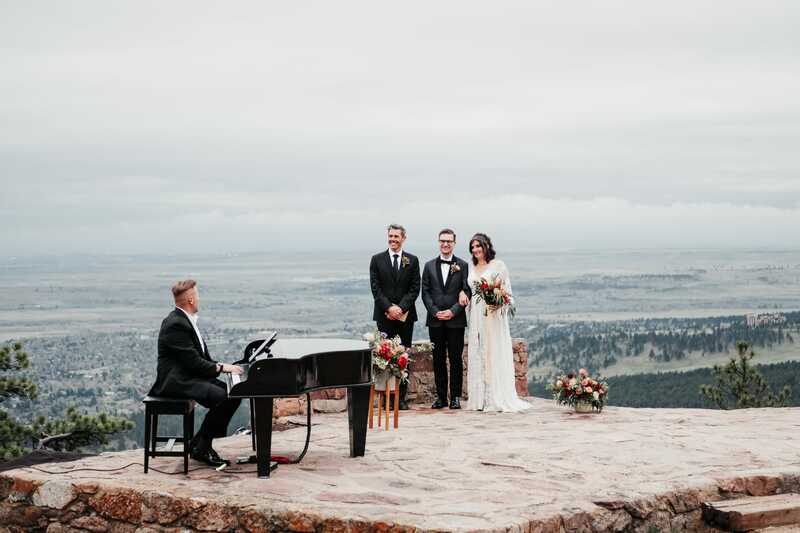 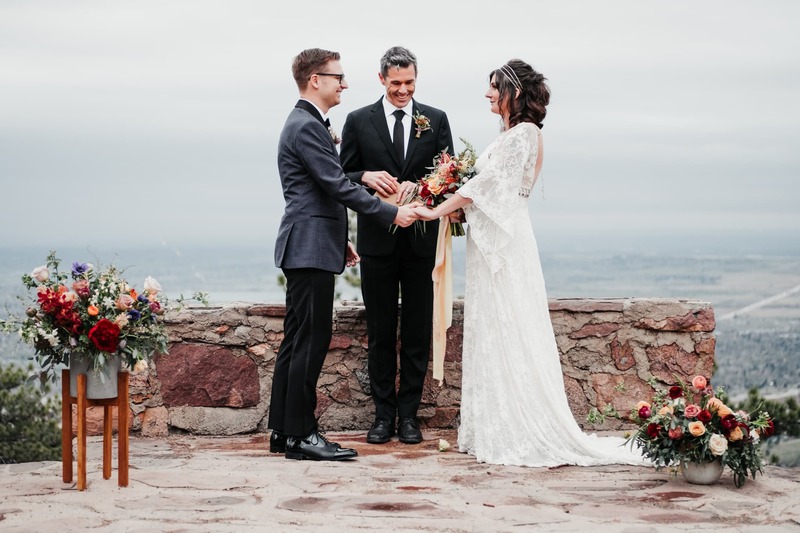 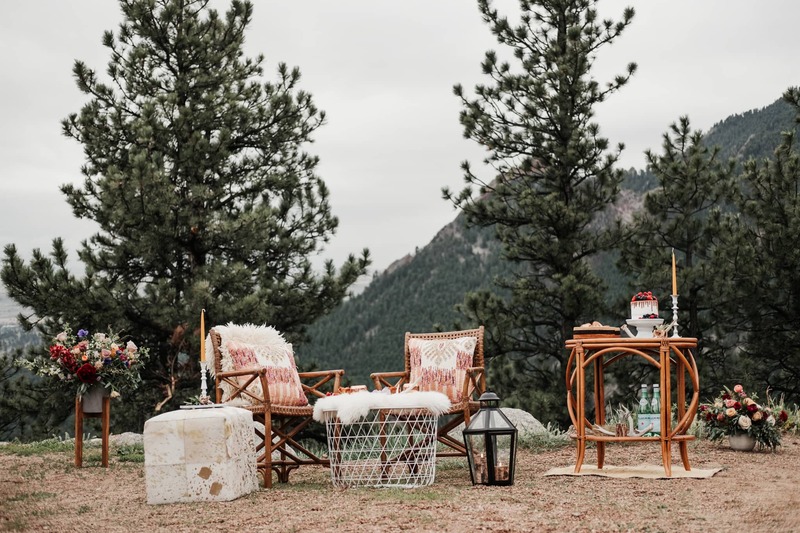 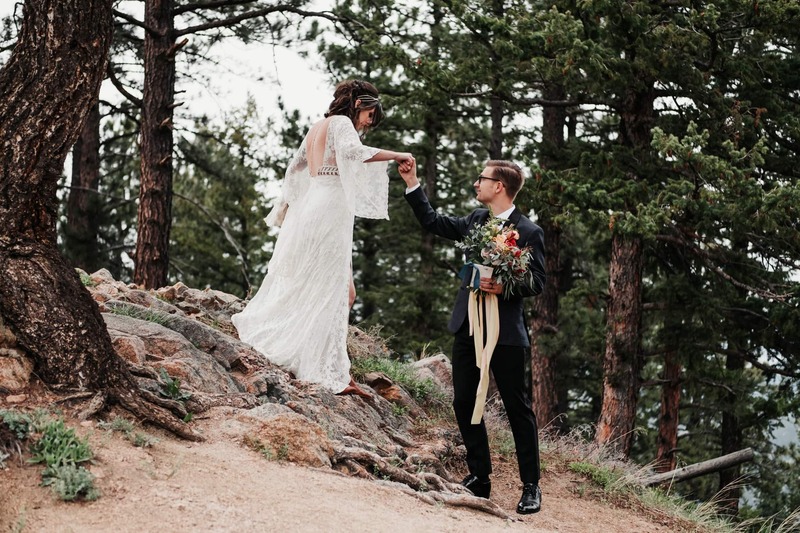 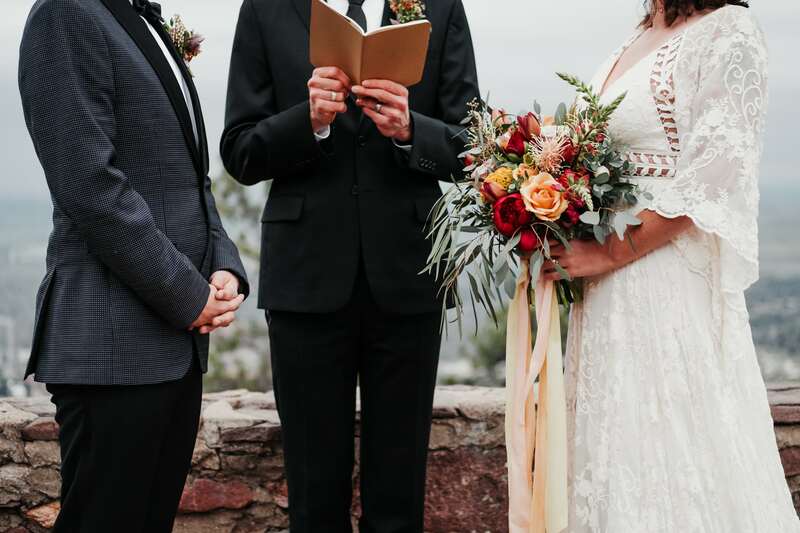 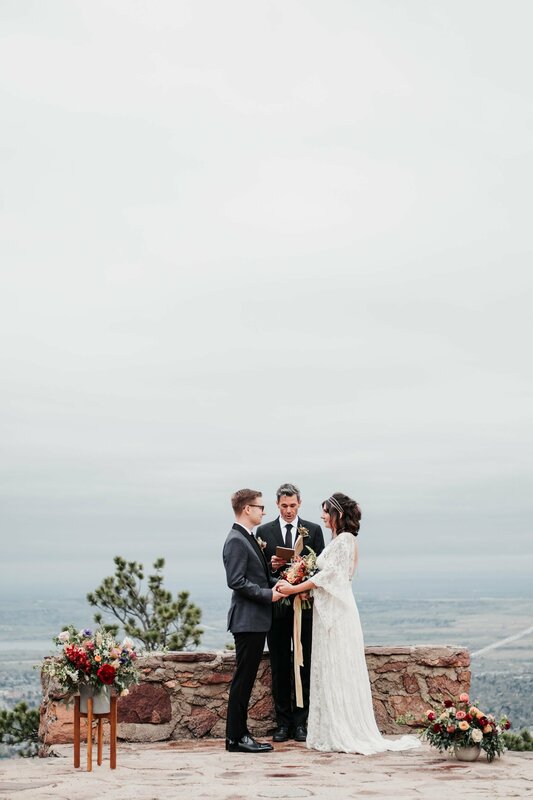 Sunrise Amphitheater, located high in the foothills of Boulder, offers some of the best views of the city and is a popular Colorado outdoor wedding ceremony venue. 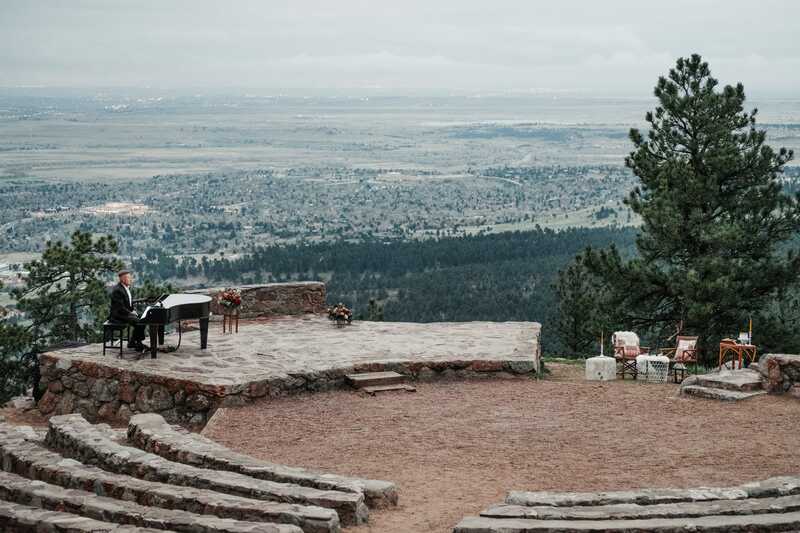 When I was planning my own wedding back in 2011, I really wanted a Sunrise Amphitheater elopement. 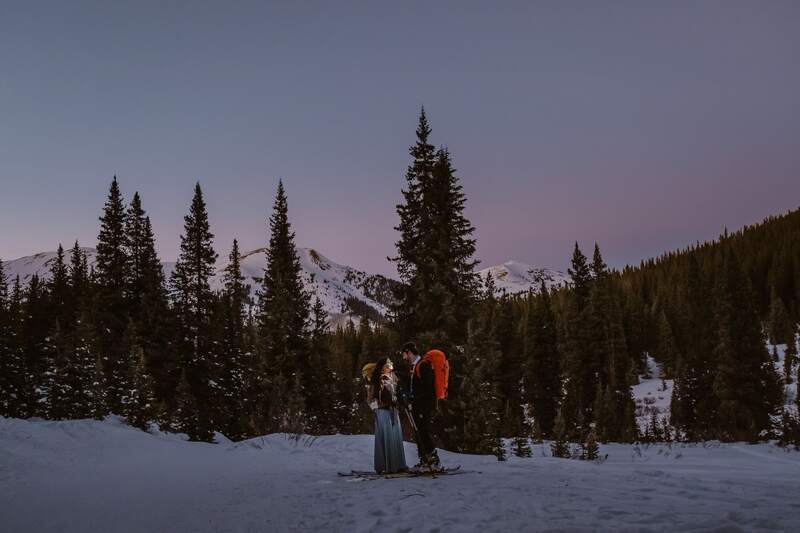 (I was actually kinda obsessed with it, because it’s used as a setting in The Stand by Stephen King, one of my all-time favorite novels.) 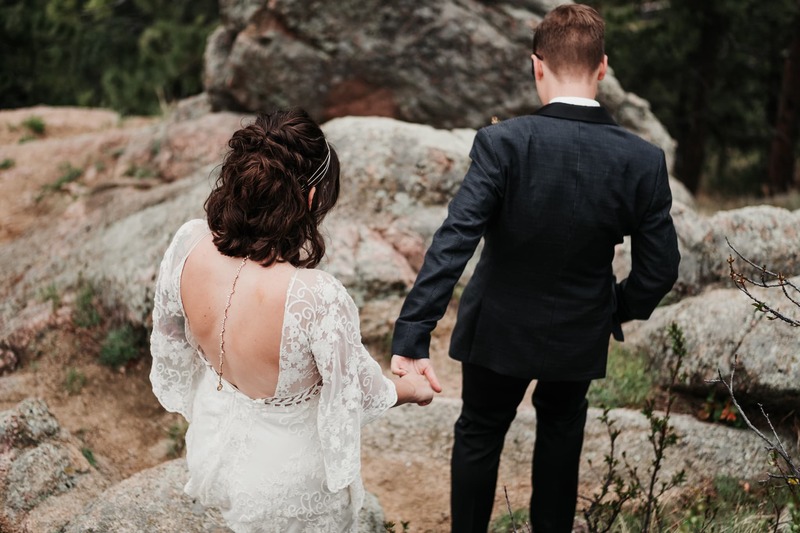 But because Justin and I got married in February, the road to the amphitheater was closed for the winter season, and so we ended up having to use a different location. 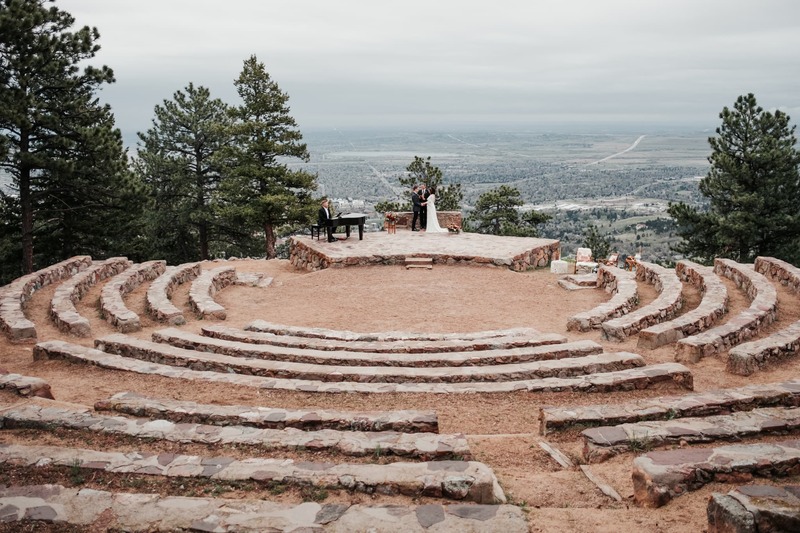 Then I started working as a Boulder wedding photographer, and it became a goal of mine to photograph a Sunrise Amphitheater elopement or wedding. 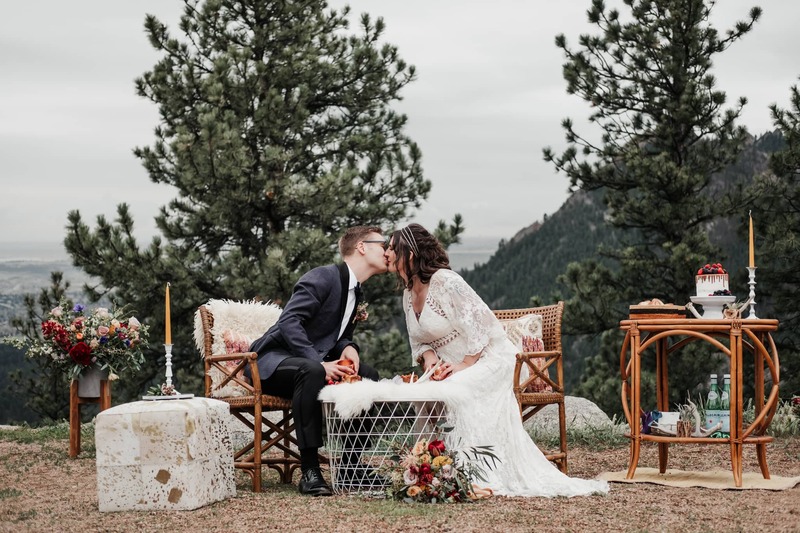 Fast forward to this past winter when I first met Lindsey Sachs, the wedding planner extraordinaire behind COLLECTIVE/by Sachs. 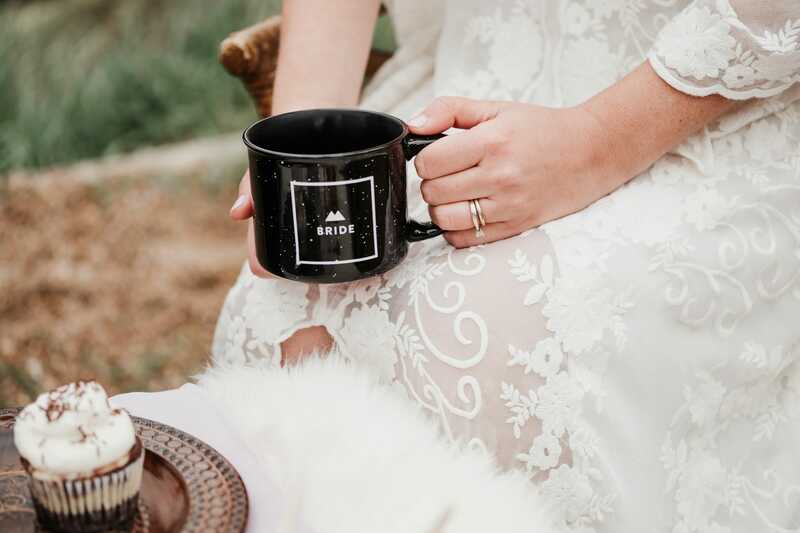 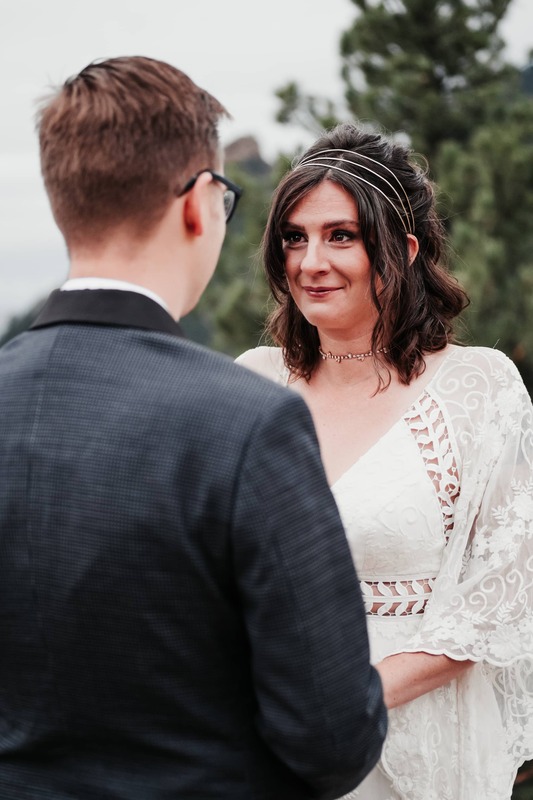 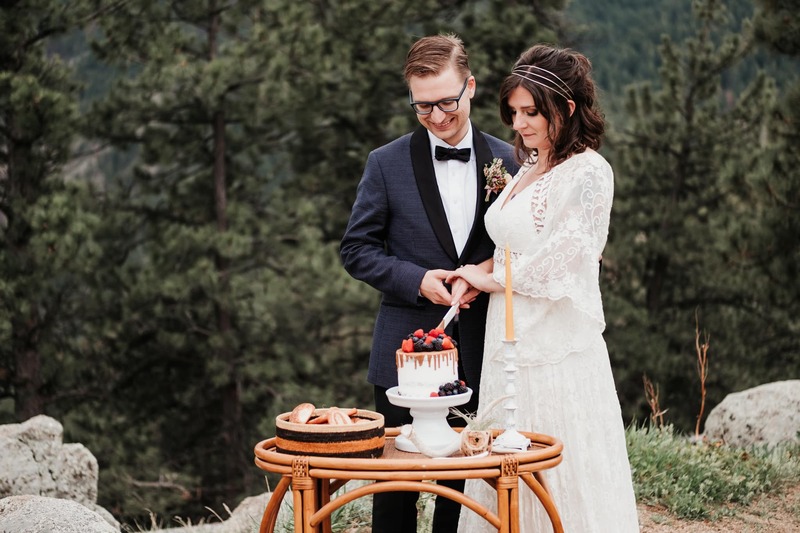 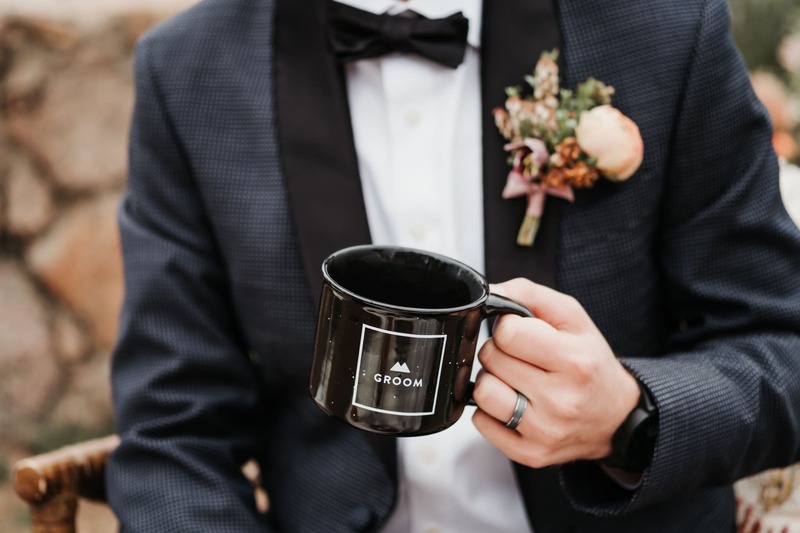 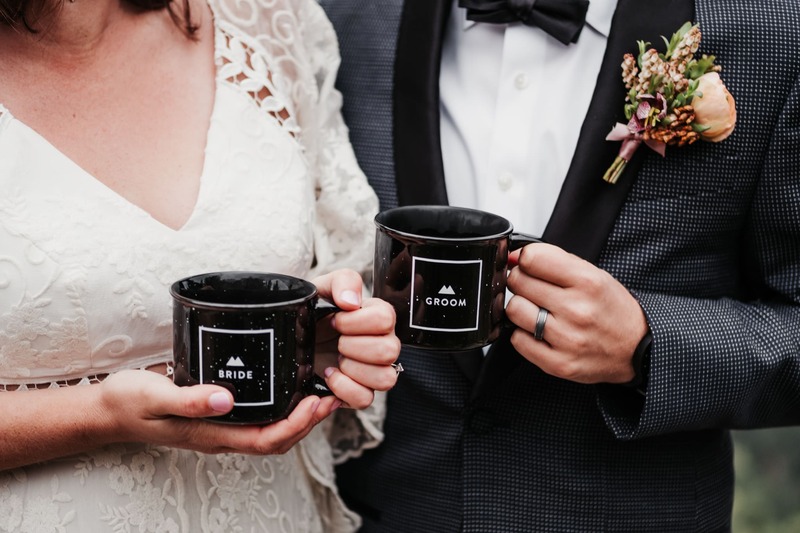 We started dreaming of planning a styled wedding shoot together, and after a brainstorming session over coffee and lunch at Alpine Modern, we decided on planning a Sunrise Amphitheater elopement. 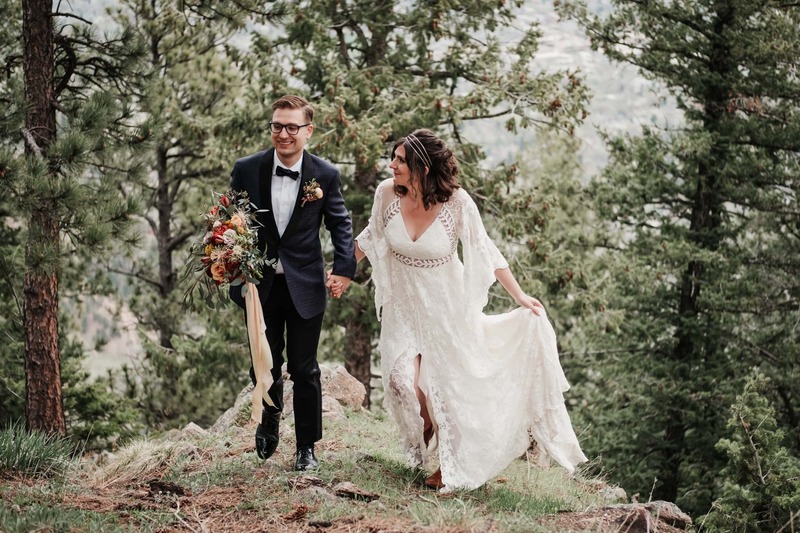 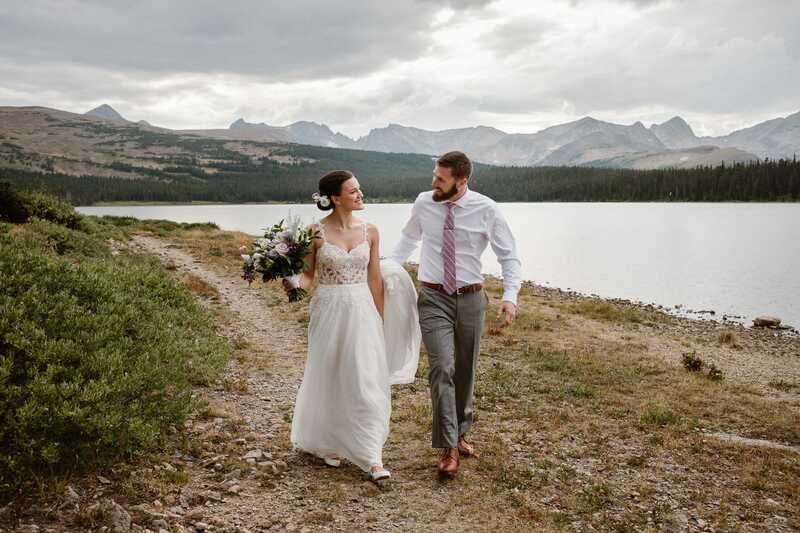 It was very important to us both to use a real-life couple as our models, to showcase the real love and emotion behind an elopement instead of just having a pair of professional models posing for photos and pretend to be in love. 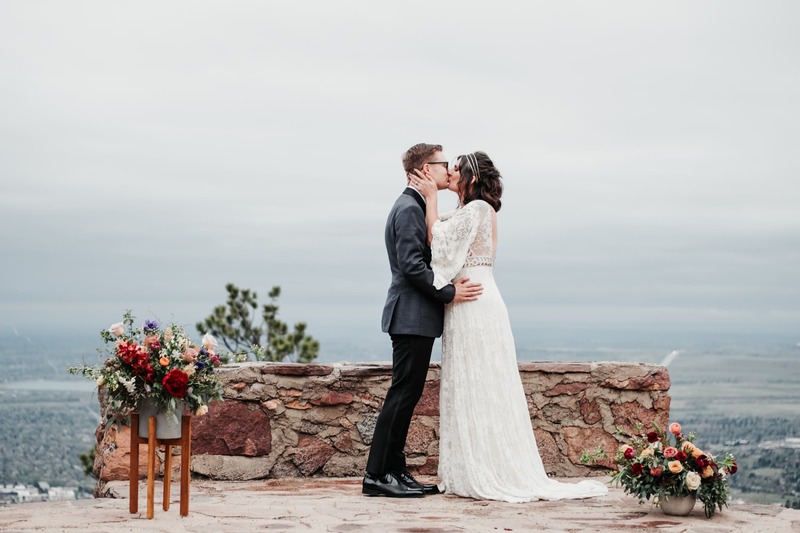 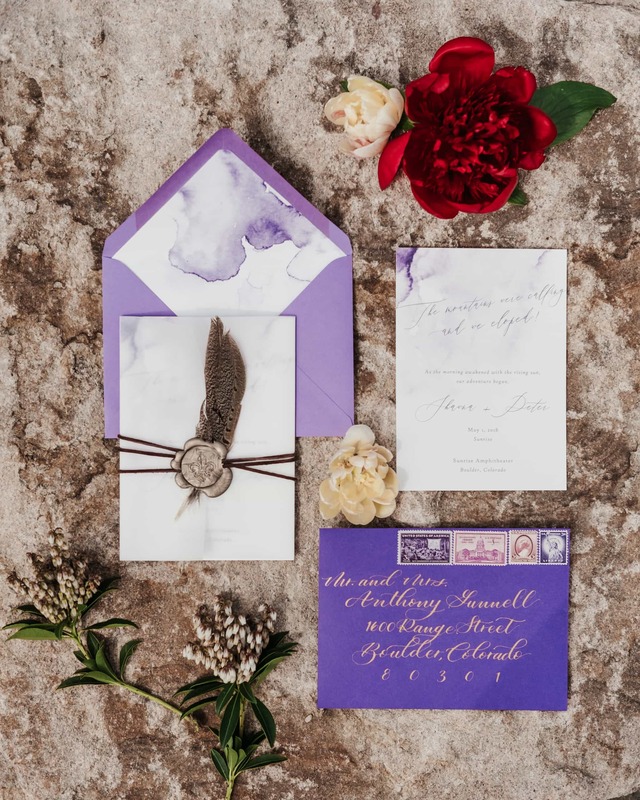 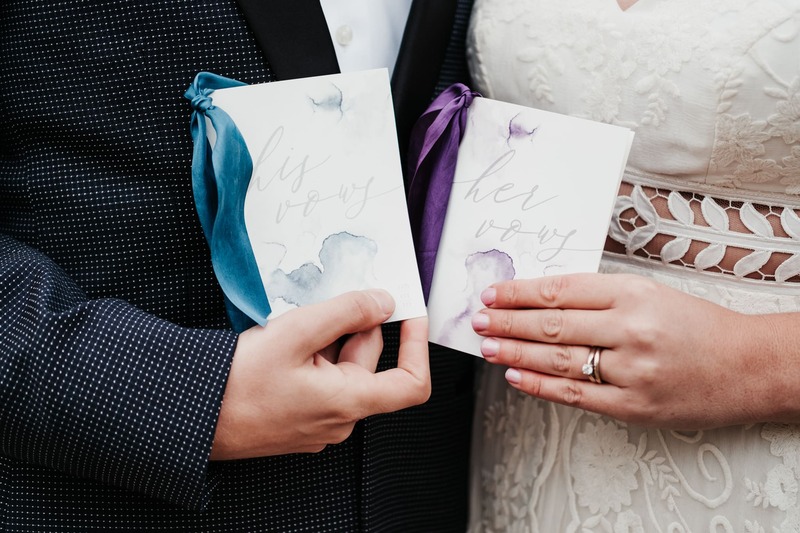 One of the things I admire most about Lindsey is how her business is built on working with happy couples who value authenticity and desire to create a deeper connection to one another and their guests during their wedding celebration. 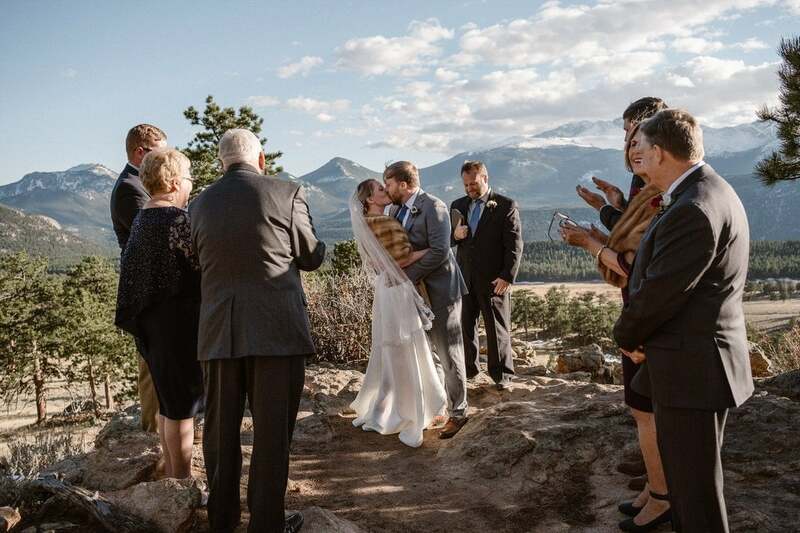 After a call for couples via our social media pages, we picked Shawna and Peter as our couple. 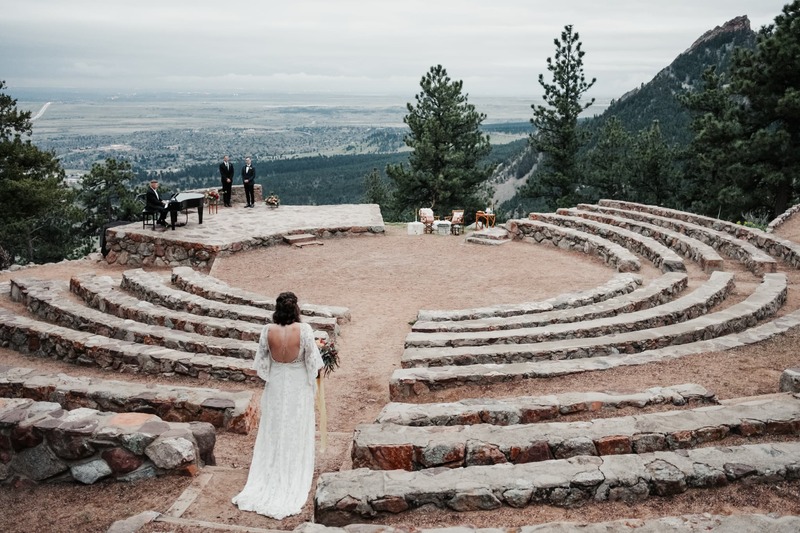 Shawna and Peter are already married, so having them do a vow renewal was the perfect way to make sure our Sunrise Amphitheater elopement felt real. 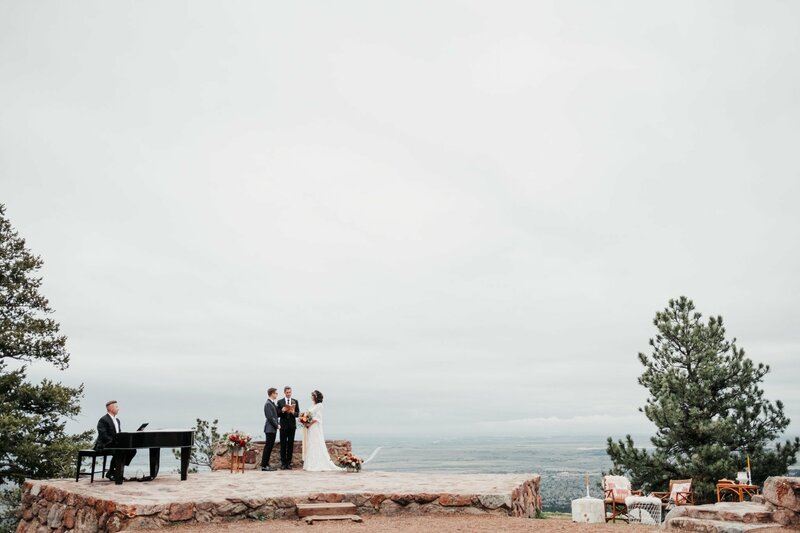 Peter actually proposed to Shawna at the summit of Mount Sanitas at sunrise, so they were the perfect couple to join us on this early morning. 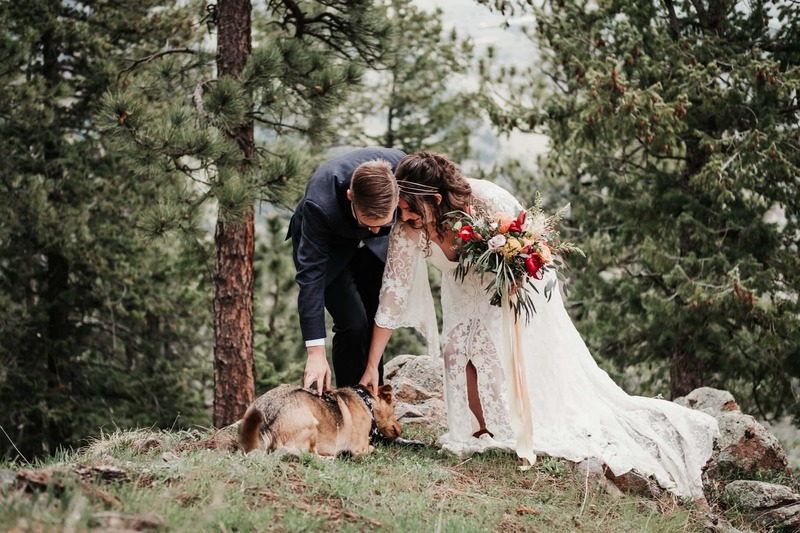 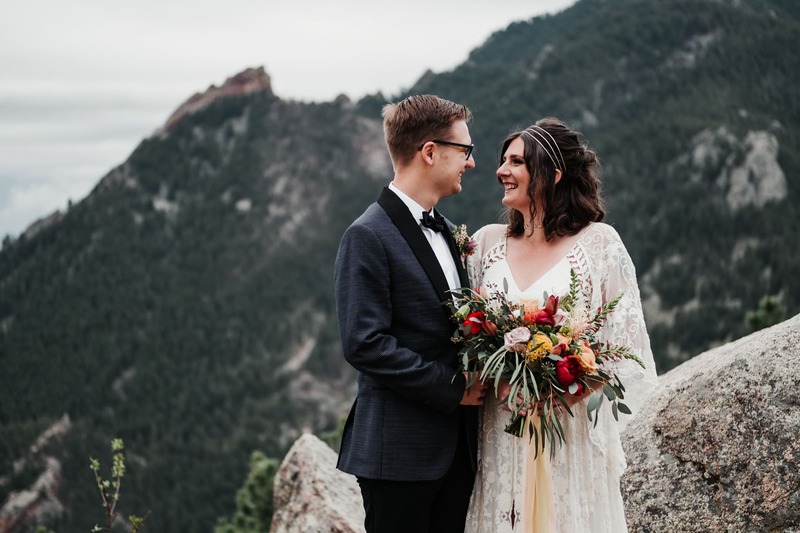 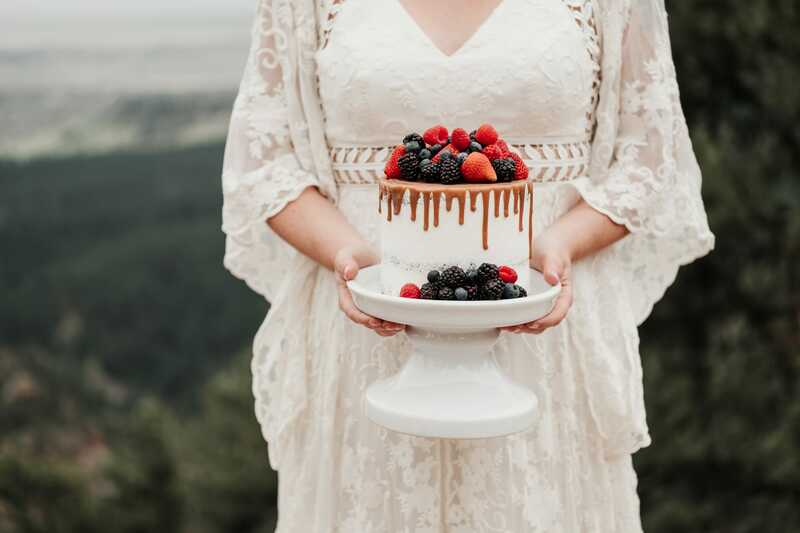 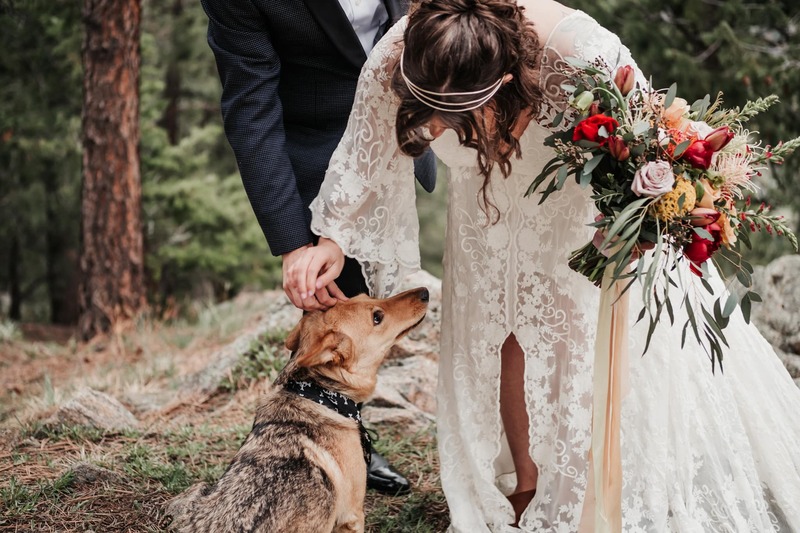 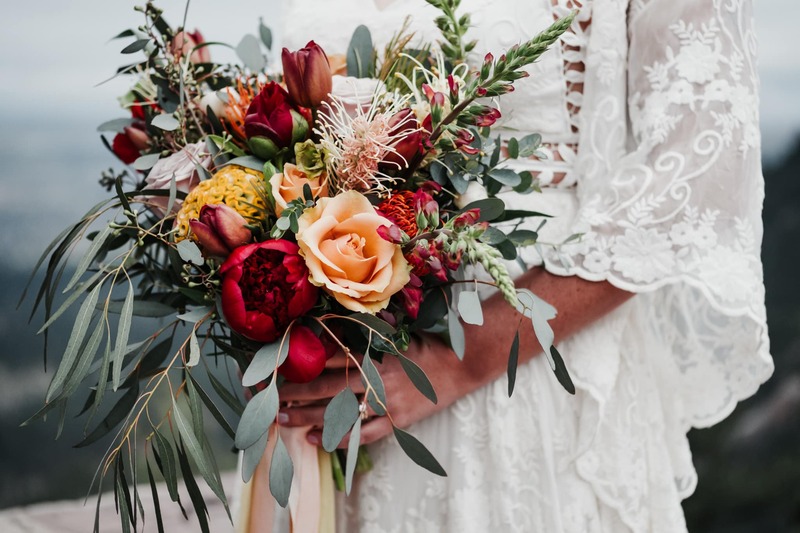 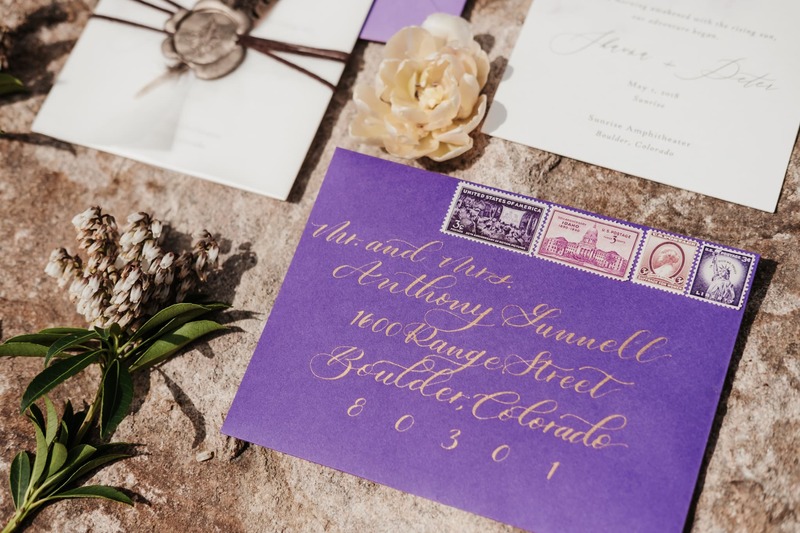 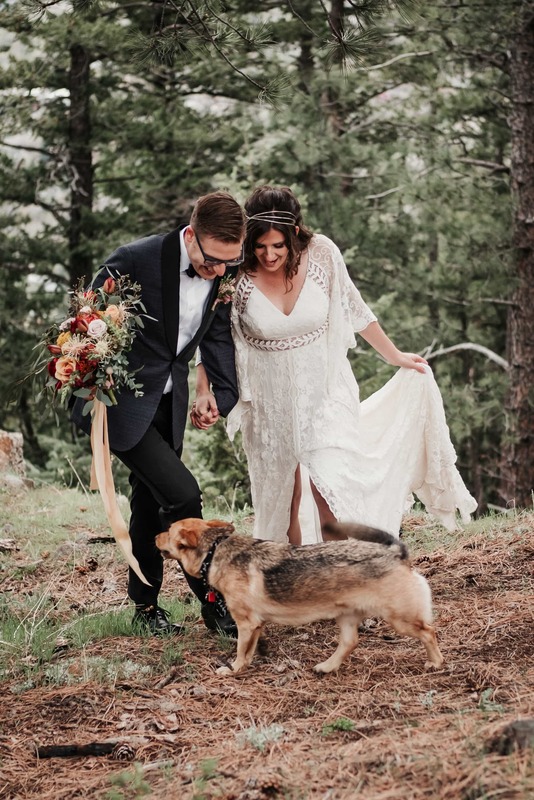 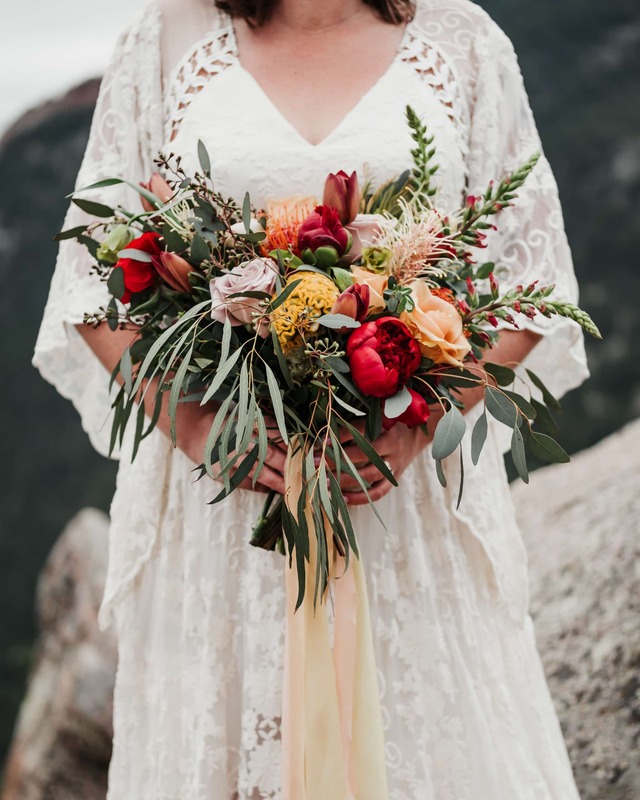 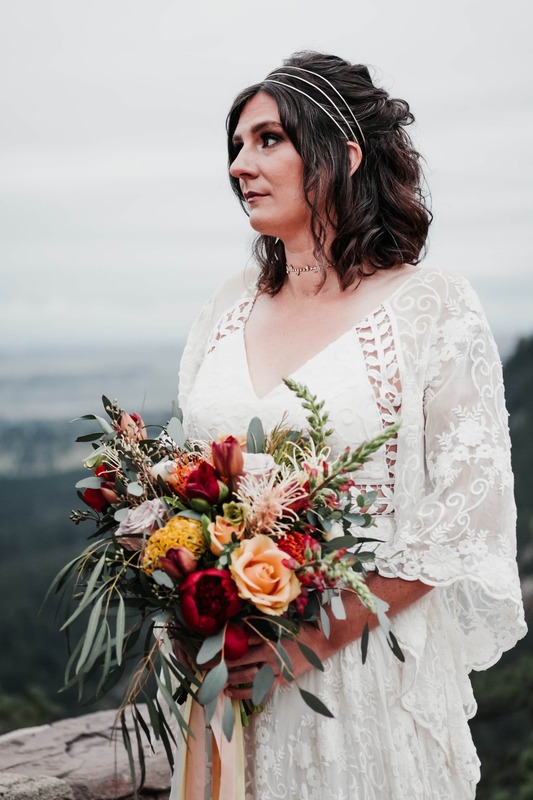 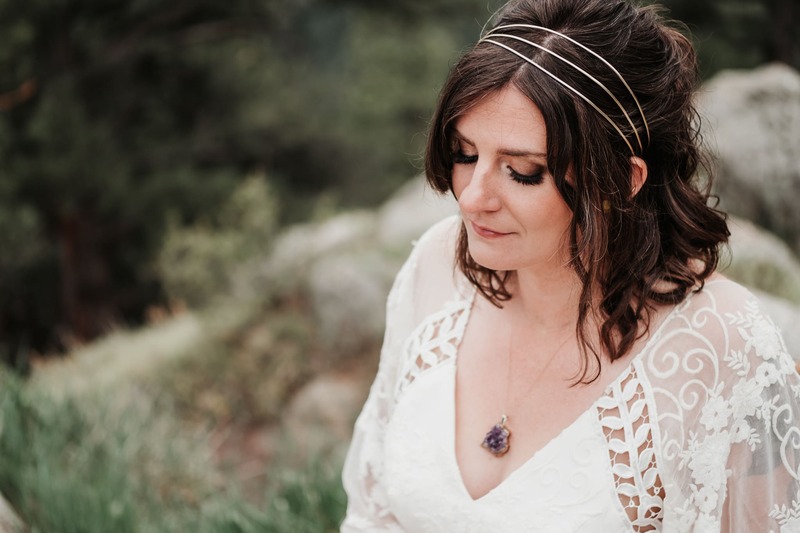 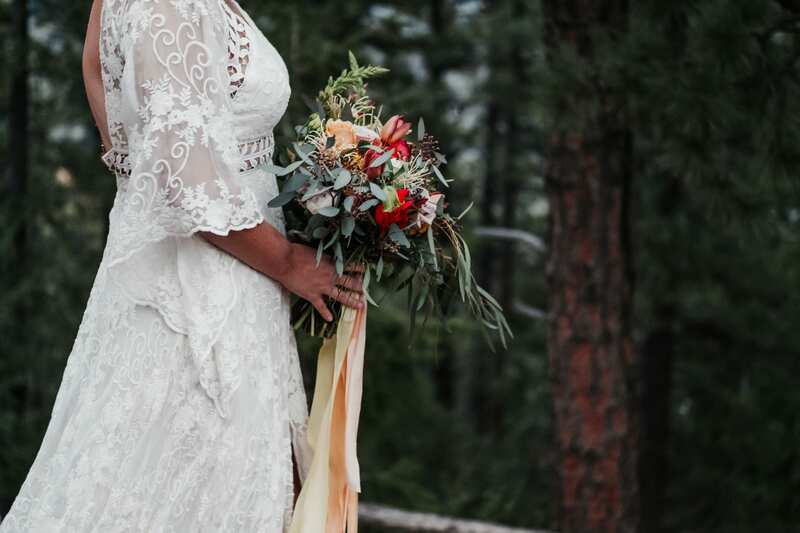 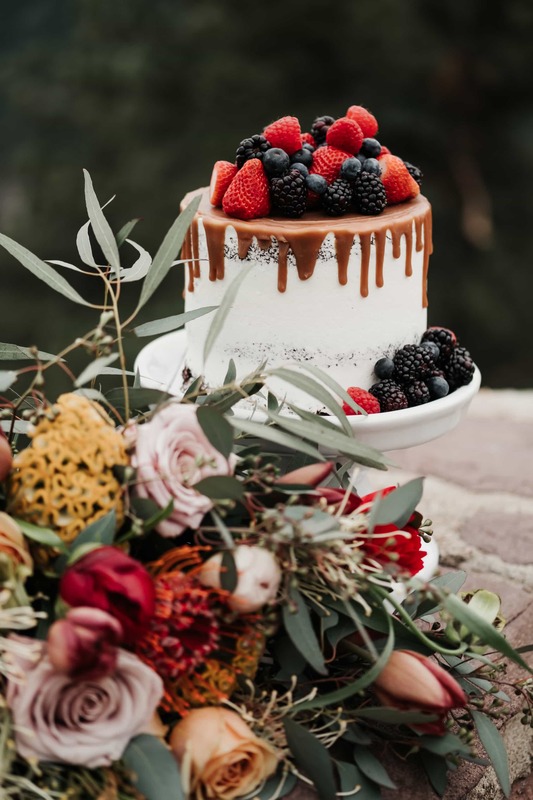 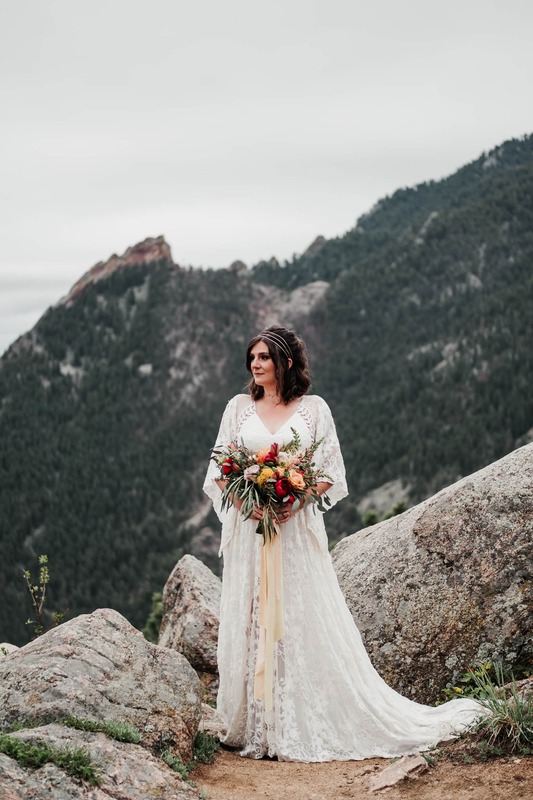 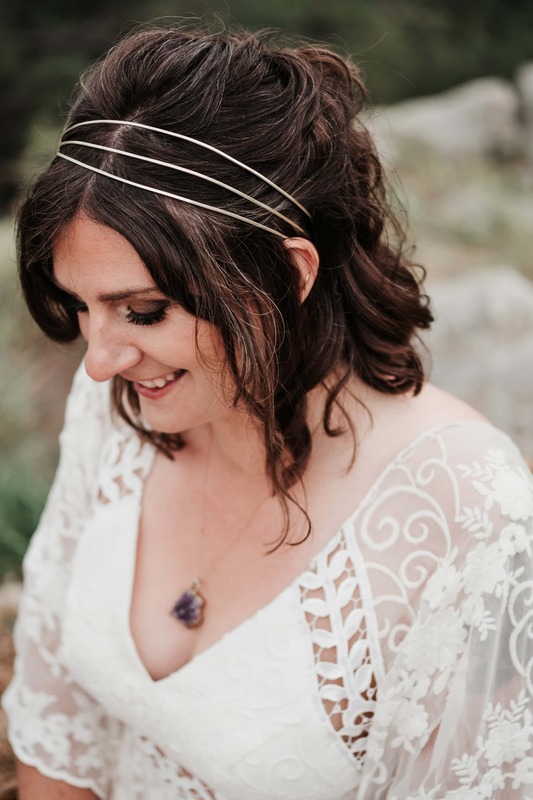 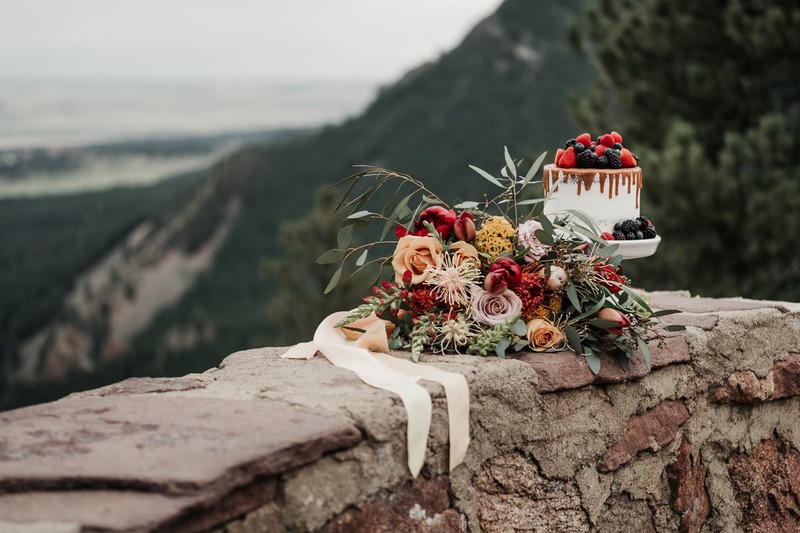 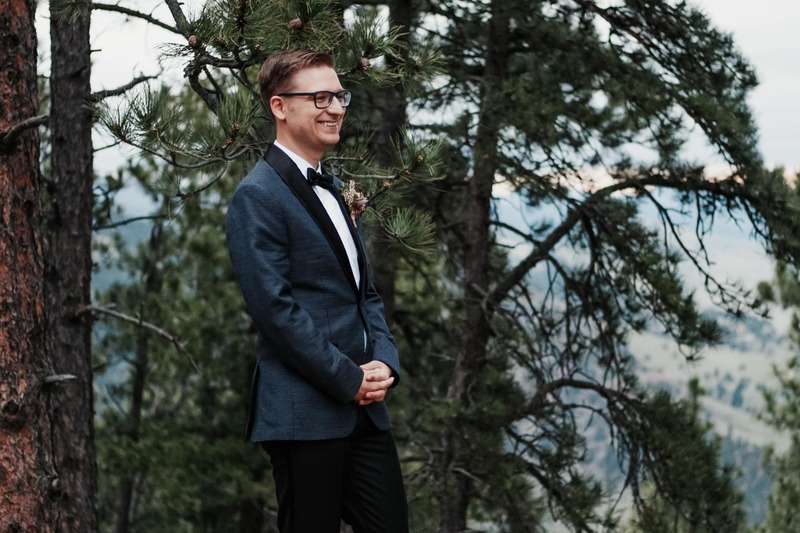 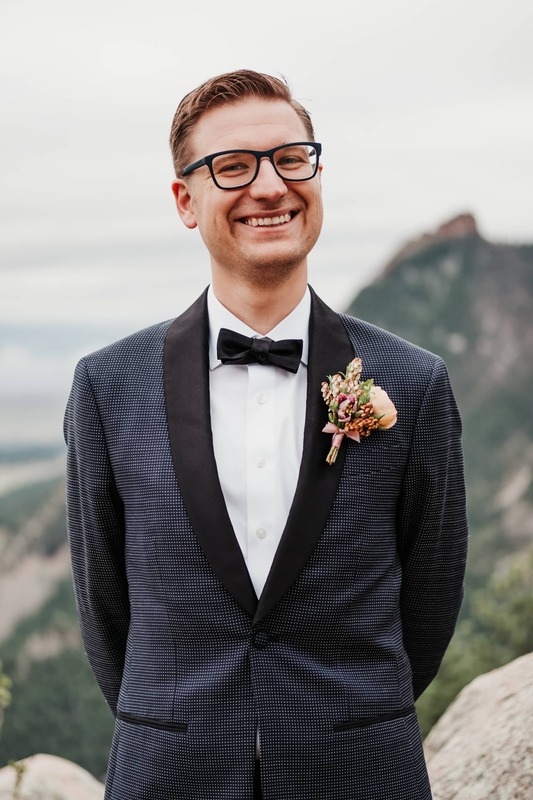 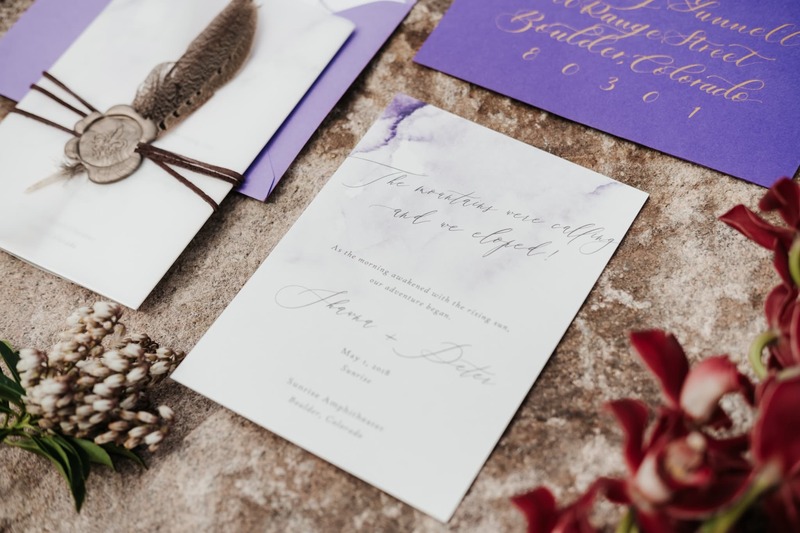 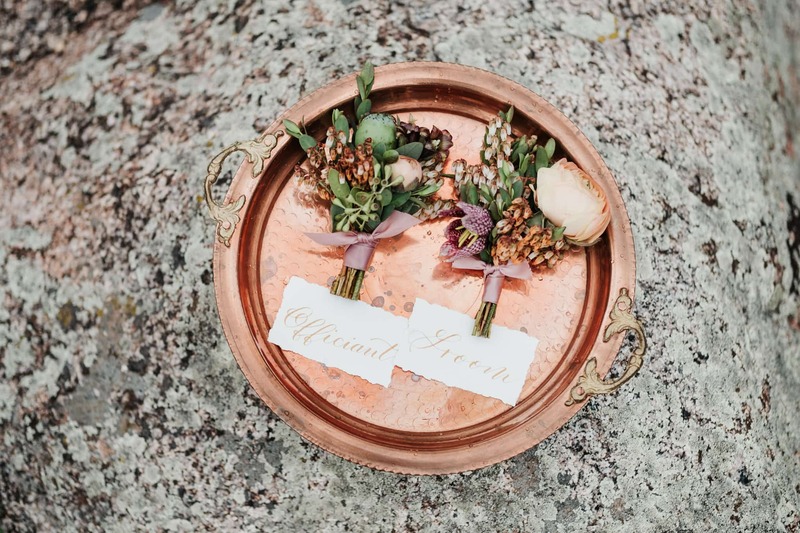 We also wanted to showcase the work of local vendors as much as possible, and Lindsey put together an amazing team of local Boulder and Denver wedding vendors to help us bring the vision to life. 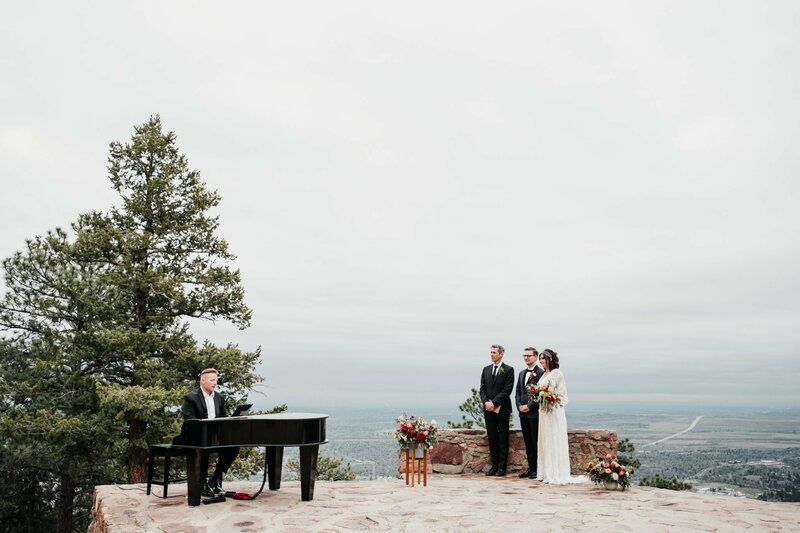 If you’re planning a Sunrise Amphitheater elopement or wedding ceremony of your own, I would love to chat with you about your wedding photography, so get in touch! 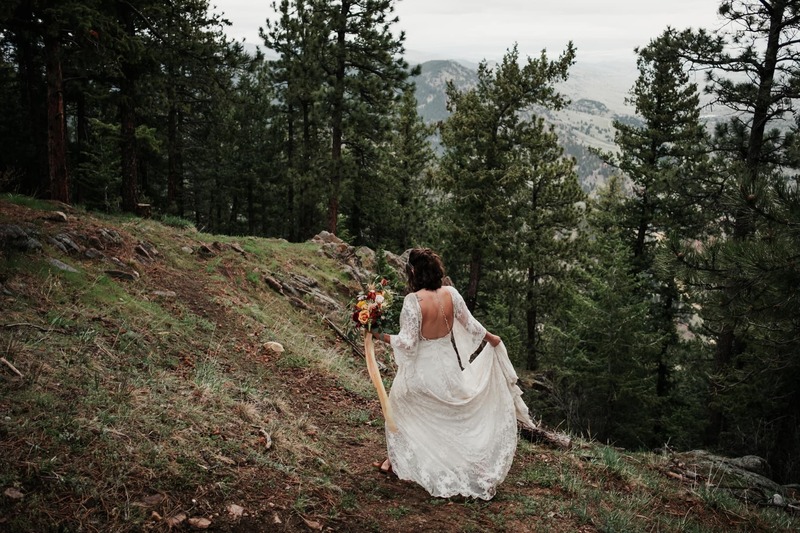 Photography – Larsen Photo Co.